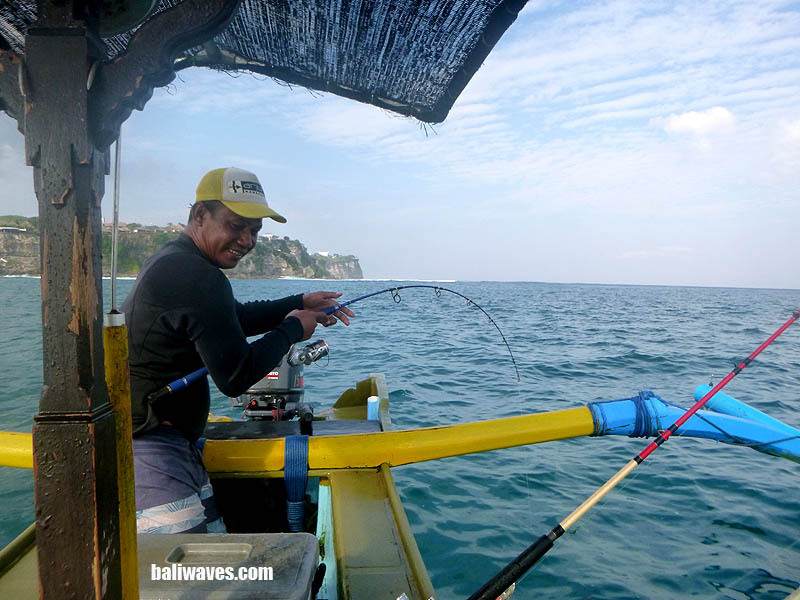 Hi surfers slash fishermen and thanks for checking out our latest Bali sport fishing up date. 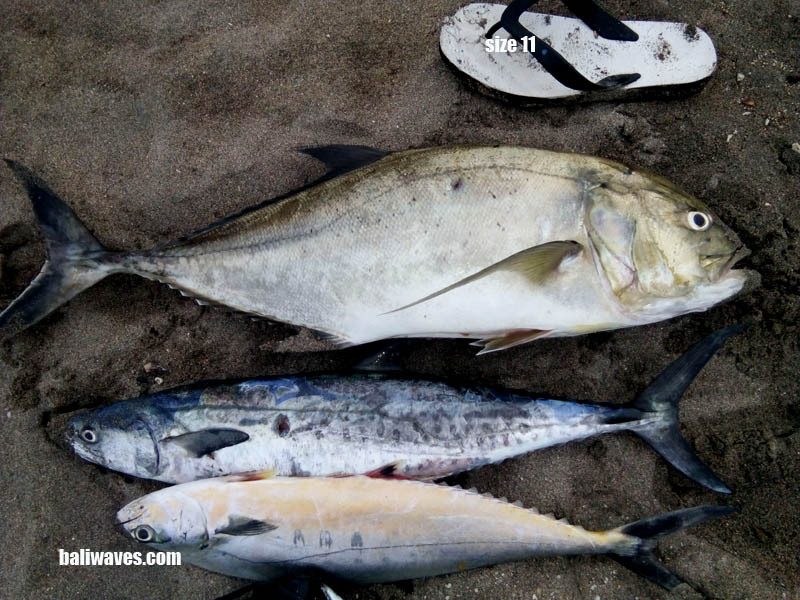 We’ve been pretty busy keeping up with the surfing scene here lately and haven’t had a lot of time to get out there on the water and forget about everything except catching fish. But yesterday the 9th my fishing buddy Wayan. 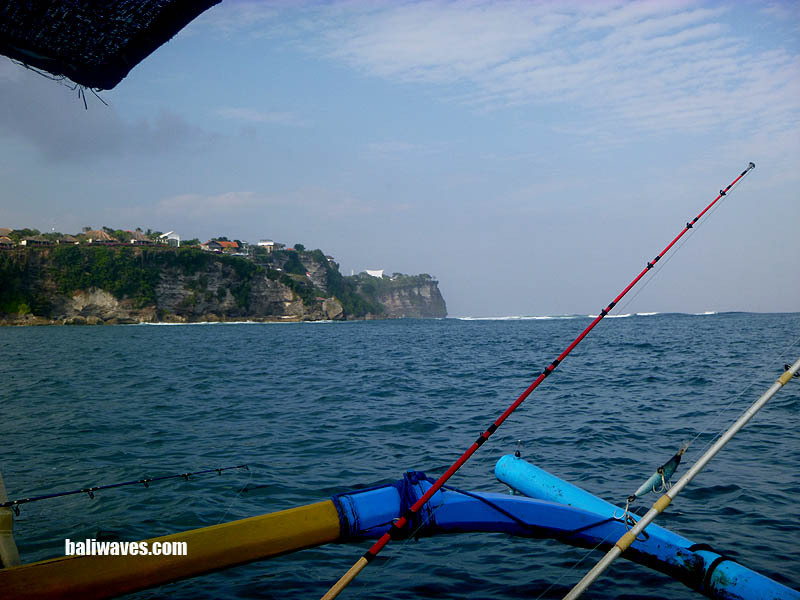 K. and I pushed the boat off the beach at 6.20AM and headed South towards Uluwatu. 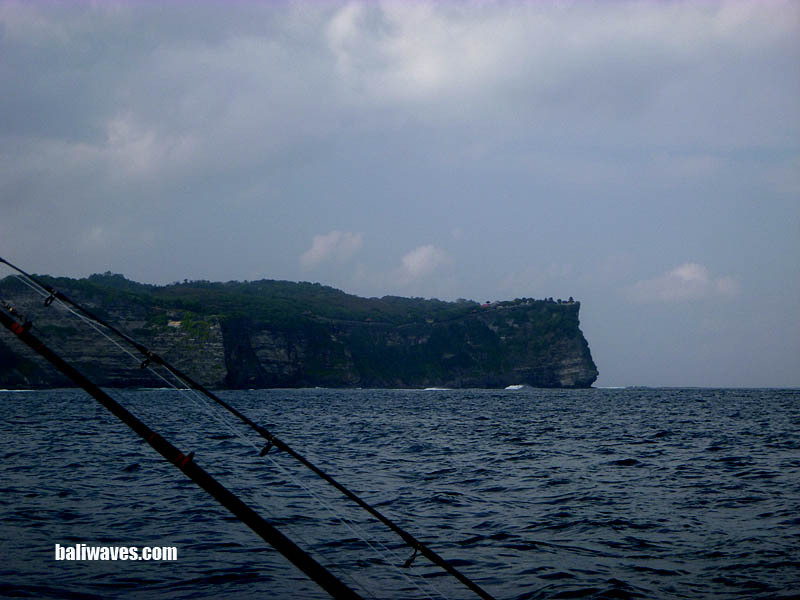 The day before I had been down at the Pro surfing contest at Uluwatu with my son, but instead of watching the surfers our eye’s were glued on the big schools of Tuna and Golden Trevelly busting up the surface half a kilometer out from the shore. So I just had to get back out there and and have some fun. I do have my own 8mtr traditional “Jukung” but yesterday I was a guest in my mates boat, taking it easy for a change. 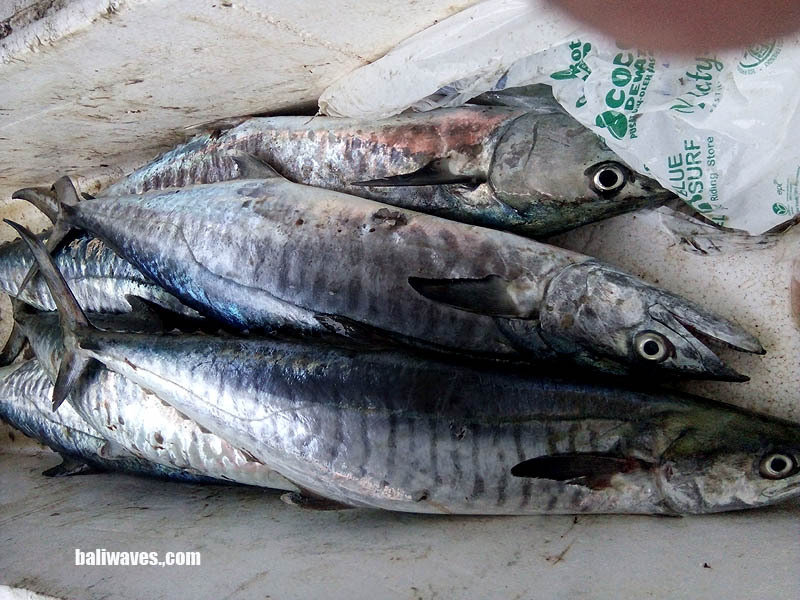 The fishing scene here is just now starting to liven up with lots of small bait fish off the West coast, which brings the bigger hungry surface feeders. 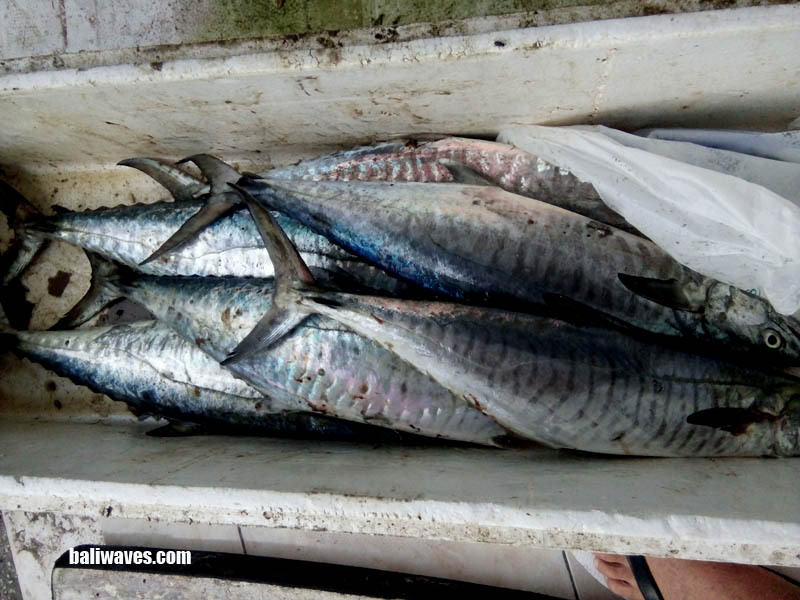 Like Spanish Mackerel, Tuna, Wahoo, Jack fish, GT’s etc, and they are what we chase. Yesterday we didn’t see any decent Spaniards jumping out of the water but there was plenty of schools of small fun to catch Tuna everywhere and thats what we are eating tonight for dinner, Tuna steaks. There was such a lot of marine life activity out there for the 7 hours we were out on the ocean. From Humpback Whales jumping out of the water on several occasions to big Dolphins and lots of Turtles as well. The ocean was clean and I never saw one plastic bag or any other plastic flotsam and jetsam for that matter. Yesterday there were a lot of boats, maybe a dozen out there doing the same thing as us but not all of them were catching fish, like we were. 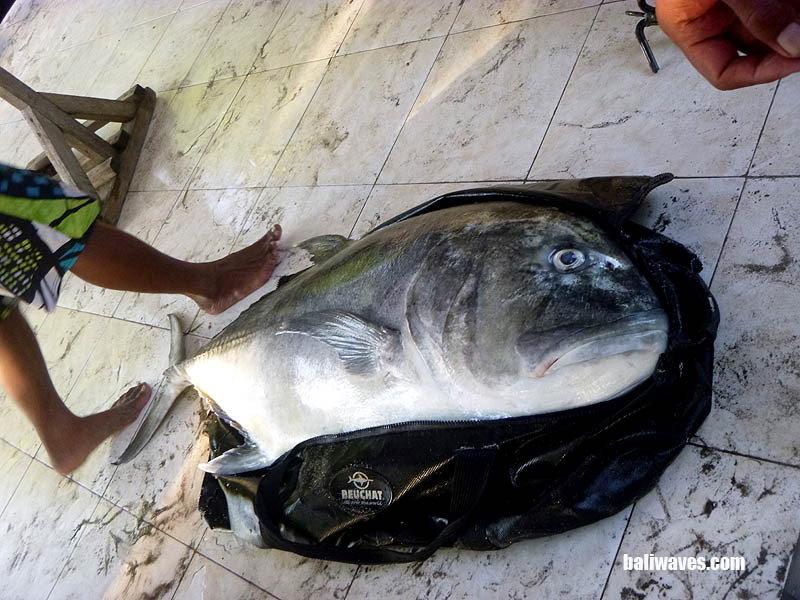 You see anyone can buy a boat and all the gear to go with it but it takes years of experience to boat fish. 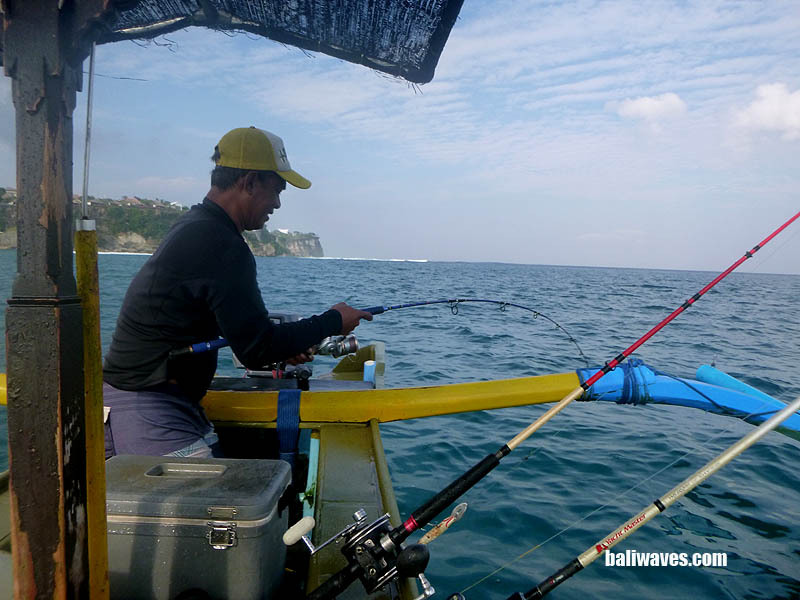 I’ve been sport fishing here in Bali for around 23yrs now and back then in the beginning there was only a handful of boats that were into it. Our boat top scored yesterday with 8 fish between the two of us and that’s the way we like it. Small Tuna on light rods and line is great fun and even better when the bigger fish are on the bite. 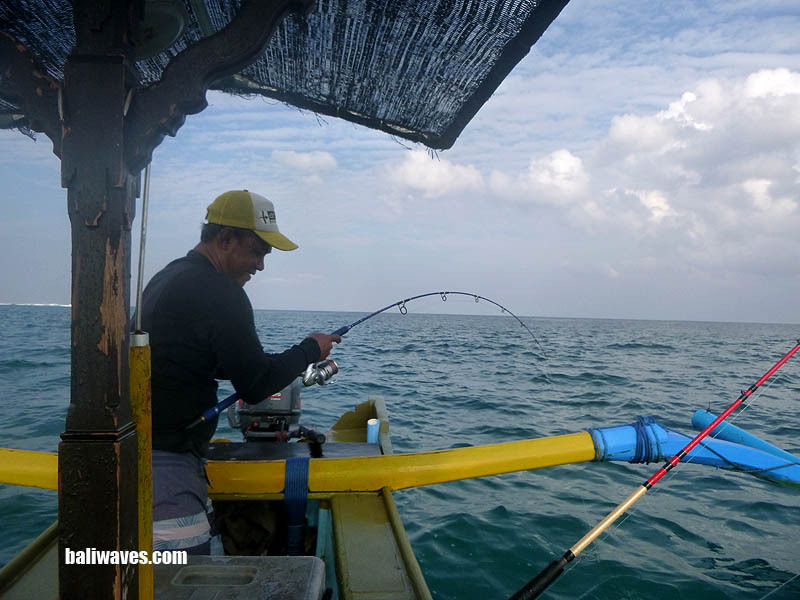 Anytime at all if you want to try your luck with us for some Bali style sport fishing drop mye an email (contact us) and we’ll do our best to get you hooked up. The boys charge a minimum of Rp1,300.000. (around 130 Aussie dollars) for up to 2 guests. All rods, reels and fishing lures are supplied. All you need is a good hat, water, snacks and some sunscreen. We have plenty of highly skilled captains and boats so bring your friends and make a day of it, we can also even arrange a Balinese style BBQ afterwards, too easy.